Two of the talks at HOPE X Saturday revolved around Daniel Ellsberg and Edward Snowden. Unless you’ve been living under a rock, you’ve heard of Snowden when he leaked thousands of classified NSA documents to several media outlets. The older readers may remember Ellsberg who released government documents, known as the Pentagon Papers, pertaining to government decisions made during the Vietnam War. It was a popular topic here as all three conference rooms were dedicated to the the talks and all three were completely filled to the point that staff again had to turn people away. Luckily, even if you couldn’t make it into a conference room you could still watch it as all talks are streamed live via the HOPE website. Regardless whether you feel these two are heroes or traitors, the talks were interesting with both giving accounts of their story. Each interview was about an hour long. Ellsberg, who was here in person, talked about his entire experience and why he felt it necessary to reveal the classified documents he had secretly made copies of. Even though Ellsberg did release what he felt was evidence that the government knew that the war could most likely not be won and would cause many more casualties, he does still feel that some things are necessary for the government to keep secret. He gave an estimate that 95% of the documents classified are over-classified at the time of document creation and after a few years only 0.5% of the those documents are still classified correctly, the remaining 99.5% still over-classified. 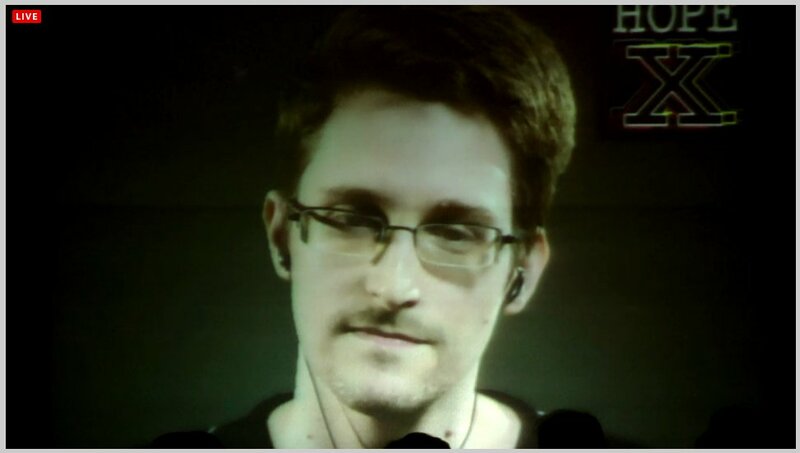 Snowden, who was available by video, was warmly welcomed and applauded by the attendees of the conference. During the talk he discussed that he did not feel that some of the NSA’s actions he was aware of were constitutional, specifically collecting enormous amounts of data of not only ‘people of interest’, but of everyday american citizens. Snowden feels that we, as a community, give too much trust in our electronic devices. He went on to suggest that the population do what it can to minimize the capability of organizations to monitor communications and track data. He urged that people, with the capability, help educate others on how to interact with technology safely, reliably and in a way that serves the interest of all people, not just a select few. Let us know what you think below in the comments. One of those projects is a Quantum Link-esque service called Q-Link Reloaded. Quantum Link was an online service available for Commodore 64 and 128 users that offered electronic mail, online chat, file sharing, online news, and instant messaging. It lasted from the mid-80s to the mid-90’s and later evolved into America Online. In 2005, a group of folks reversed-engineered the original server code and the resultant Q-Link Reloaded lets the Commodore folks once again communicate with each other. In my last post I mentioned that we are meeting a lot of interesting people here at HOPE X. One of those interesting people is [Miriam] who is performing Logo Removal in the vendor area. If you don’t know what that is, you are not alone, neither did we. She doesn’t much like the idea of being a walking bill board for any ole company and has been removing logos from cloths for a while now. [Miriam] did us a solid and removed a logo from one of the shirts we are giving away. The process starts by flipping the shirt inside out. A piece of scrap fabric larger than the logo is pinned in place in the logo area. The shirt is then flipped right side out and a shape is sewn around the logo, joining the shirt with the scrap fabric. Scissors are then used to cut the logo out of the shirt being careful to only cut the shirt and not the fabric underneath. The shirt is then flipped back inside out and the excess scrap fabric is trimmed away. That’s it. What about the shape? [Miriam] likes to make them up as she goes along and admits that they aren’t anything specific. She likes the design to be whatever the viewer feels it is. It’s a fun project that invites conversation. Leave us a comment below telling us what you ‘see’ in the now non-HaD shirt shape. HOPE X is happening. There are tons of people here. Tons. So many that people (including me) have been turned away at the door for popular talks. Overall, we are having a great time and meeting some interesting people. I admit to having zero lock picking experience. It’s something I’ve thought would be neat to learn about for a long time. Well, today was the day…. I attended the “Lockpicking, A Primer” presentation and it was great. They started with the basics, discussing the appeal of lock picking and where organized Lock Sport started. The presentation consisted of excellent graphics and clear explanations of the lock picking process. They went over the anatomy of a lock and how they work as well as the tools used and tool types. The talk also progressed into more advanced topics. There is even a lock picking village where you give it a go. I’ll be trying it out for sure. Couldn’t make it to NYC for the event? All of the talks are streamed live. You’ve probably heard that Hackaday has a booth at HOPE this year. Swing by and say hi. You could probably convince us to give you a shirt! For the next three days, Hackaday will be live, in the flesh, at Hotel Pennsylvania in NYC. It’s HOPE X, the biennial conference for hackers, code crackers, and slackers put on by the awesome folks at 2600. Highlights of the event include a keynote from [Daniel Ellisburg], a video conference with [Edward Snowden], and a whole bunch of other stuff. Hackaday has a booth (thanks, overlords!) on the mezzanine right with the other vendors, right behind the Club-Mate table. We’ll be putting up random updates from HOPE the entire weekend. If you’re visiting, stop by and we might have a t-shirt for you. In a little less than two weeks, the biannual HOPE conference in NYC will be in full swing. Attendance is more than likely to put you on a list somewhere, so of course we’ll be setting up shop, enjoying the sights and sounds, and throwing swag at hundreds of attendees. Highlights of HOPE X include a keynote from [Daniel Ellisburg], a video conference with [Edward Snowden], a Q&A with the EFF, a talk I’ll certainly be attending, and the always popular talk on social engineering headed up by [Emmanuel Goldstein]. As with all our extracurriculars, Hackaday will be giving out some swag (200+ tshirts, stickers, and THP goodies), and manning a vendor booth. Look for the eight foot Hackaday flag held up with duct tape. We’ll also be doing the usual video and blog thing from HOPE, for all of you who can’t attend thanks to your company’s security reviews, and some super secret things I can’t believe the overlords signed off on. In other 2600 news, they ain’t doin too good, with tens of thousands of dollars of debt thanks to rather crappy legal stuff with their distributors. Buying a ticket would help the 2600 guys out, as would buying July’s issue (also on Kindle).